The Lysobacter spp. are ubiquitous inhabitants in the diverse environment that have some unique features including gliding motility and high genomic G + C ratio (65–72%). They produce a wide variety of antimicrobial compounds (lytic enzyme and antibiotics) and thus have high promise to biocontrol of plant diseases caused by fungi, peronosporomyctes, nematodes, and bacteria. Among 21 identified species, biocontrol activity of Lysobacter enzymogenes strains C3 and 3.1T8 and Lysobacter sp. SB-K88 has extensively been investigated. Mechanisms of biocontrol of phytopathogens by Lysobacter spp. include (1) secretion of lytic enzymes and/or antibiotics including tetramic acid-containing macrocyclic lactams, (2) high plant colonization through characteristic perpendicular attachment, (3) development of induced systemic resistance in host plants, (4) hyperparasitism involving types III, IV, and VI secretion systems, and (5) exhibition of micropredatory behavior to the pathogens. Lysobacter spp. were also found as functional bacteria in the disease-suppressive soils. 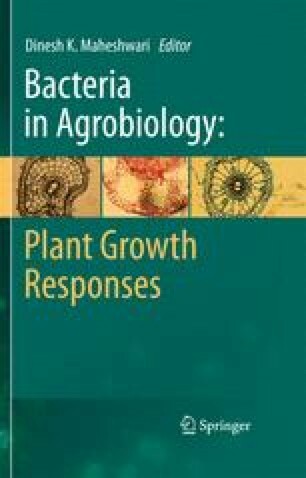 This chapter reviews the advances of research on biocontrol activity of plant diseases by bacterial antagonists Lysobacter spp., with special reference to Lysobacter sp. SB-K88. Mode of antagonism and potential use of Lysobacter spp. as biological control agents are also discussed.